This Statement of Purpose sets out Adoptionplus' aims and objectives. It explains our values and principles, the services we provide and the way we provide them. This Statement of Purpose is regularly reviewed and updated at least every twelve months. The information provided meets the requirement of National Minimum Standards for Adoption, and the related regulations (Voluntary Adoption Agencies and Adoption Agencies (Misc. Amendments) Regulations 2003). Adoptionplus wants to ensure that children who are not able to live with their birth families grow up in safe, nurturing and healing families where they are able to develop to their full potential. We want to encourage adopted children to have a positive sense of themselves and a clear understanding of their history. We want children to have good self esteem, be able to make friends and grow up in a family where fun and laughter are part of everyday life. We believe that the best way to do this is to ensure that adoptive families are provided with the comprehensive, high quality support they need, at the times that they need it. We believe that it is essential that we learn from what works, and ensure that we keep ourselves informed of all research and good practice in the field of adoption. Alongside this, Adoptionplus also recognises the impact on birth families who lose their children to adoption. We want to ensure that birth families receive the support they need in order that they can start to heal and move forward in their lives. As an agency, we understand that adoption has lifelong implications for all involved. We believe that the child’s welfare, safety and needs should be at the centre of the adoption process. We believe that a child’s wishes and feelings should be actively sought and fully taken into account at all stages. We believe that delays in adoption can have a severe impact on the health and development of children and should be avoided wherever possible. We believe that it is essential in the process of matching a child with his/her adoptive parents that as much information as possible is gained in order that informed decisions can be made. We believe that to truly understand individual child and adult needs, skills and strengths, is central to providing effective support services. We believe fun and play are important aspects of a healing adoptive family. To ensure that adopted children grow up as part of a loving family, who can meet their needs during childhood and beyond. To recruit, assess, train and approve sufficient suitable families who are able to meet the varied needs of children referred to the adoption service. To ensure that our services promote equality and do not discriminate against anyone on the basis of their age, marital status, gender, sexual orientation, disability, ethnic origin, religion or culture. To ensure that all our therapeutic services take into consideration current research and best practice in the field of adoption support. To ensure we incorporate creative and fun aspects in our support services. To ensure that all staff employed by Adoptionplus are appropriately qualified, experienced, recruited, supervised and supported in carrying out their responsibilities. To ensure we involve and consult service users in the delivery and development of services. To ensure we maintain confidentiality and security of all adoption records and information. To work with the whole family network, as we recognise the importance of the support that family and friends provide to the adoptive family. To work with schools, as we believe sharing knowledge and adopting a joined up approach can help children with trauma and attachment difficulties. By increasing understanding of attachment and learning, we believe schools are better able to provide education in a way that children can access. With regards to our services for birth relatives, we aim to help birth parents come to terms with the loss of their child through a creative and flexible approach to counselling. We aim to not only provide an emotionally helpful and supportive service, but also to improve insight in order to change negative behavioural patterns. Our service objectives are to assist where appropriate in the quality of any contact between the child and birth parent. We aim to assist birth parents in accessing any additional specialist support services that may be helpful to them. We aim to work closely with local authority adoption and permanency teams to ensure our services remain consistent with their requirements. Adoptionplus welcomes everyone who is interested in becoming an adoptive parent. We have a commitment to treat people fairly, openly, without prejudice and with respect throughout the adoption process. People will be responded to promptly and given clear information about recruitment, preparation, assessment and approval procedures. Once there is agreement for Adoptionplus to proceed with your assessment, you will be invited to submit a Registration of Interest form to start your adoption assessment process. There are two stages involved in the adoption process. Stage 1 lasts for 2 months. This includes your Adoptionplus worker undertaking a range of standard checks (including DBS), contacting referees, arranging medicals and further interviews to get to know you better. You will also attend the first two days of Preparation Training. At the end of Stage 1, a decision will be made about your suitability to proceed to stage 2. Stage 2 of the process lasts for 4 months and involves detailed preparation and assessment and producing a Prospective Adopter’s Report. This process aims to identify the strengths, skills and qualities that you will bring to adopting a child. This assists us in getting to know you so that you can be matched with the right child for your family. It also aims to ensure that you are given the right information so that you are better prepared for your role as parents. Days three and four of Preparation Training occur in stage 2. With your consent we also provide training for your close family and friends to help them also understand about adoption and how best to support you once your child has come to live with you. Once the assessment report is prepared, a copy is shared with you and any comments you make regarding the content are included before the report is finalised. Your assessment report will be presented to the Adoptionplus Adoption Panel which you will be invited to attend. The Panel will make a recommendation regarding your suitability to adopt. You will be informed of the Panel’s recommendation after the meeting and this then goes forward to the Adoptionplus Agency’s Decision Maker who will make the final decision regarding your adoption. Once you have been approved as an adopter, we will work with you to find the right child for your family. We have good working relationships across the country with a number of local authorities who refer children to us. Once we have found a child or children who you believe would be right for you, you will receive information about them and their background history. Your social worker will help you to consider and understand the information available. Your assessment is also shared with the child’s worker. Your Adoptionplus social worker will also undertake additional work to understand the child’s experiences and needs, enabling us to consider what support services may benefit your child in the future. Once we have found a child or children who we all agree is right for you, assessment reports for you and your child are presented to the local authority Adoption Panel for a decision regarding the child being matched with you. Your Adoptionplus social worker will help you to prepare for your child coming to live with you and will attend adoption placement planning meetings with you regarding your child, to plan the introduction process. This is a period where you and your child spend time getting to know each other, with the support of the foster carer and your Adoptionplus social worker, before they move in to live with you. The Adoptionplus multi-disciplinary Therapy team are available to support you and your child when you need it throughout their childhood. The team members have considerable training and experience of working with adopted children and their families. Many parents find it reassuring to know that specialist, effective support is there for them and their child if and when they need it. Once your child has been living with you for ten weeks you can make an application to legally adopt your child. However, each family is different and it is important that you make this decision when it is the right time for you and your family. Once the Adoption Order has been granted your child legally becomes a full member of your family. Adoptionplus will continue to offer ongoing support to you and your child throughout childhood, at no cost and whenever you may need it. Feedback forms completed after every 6th session by our Birth Relative Counselling service clients. Feedback forms from families (parents and children). On-line Survey Monkey feedback from social workers, children and parents. Feedback questionnaire responses from local authorities. Local authority evaluations via quarterly reports. A copy of the agency’s complaints procedure is available. The Statement of Purpose can be supplied in different formats appropriate to the physical, sensory and learning impairment, communication difficulties and language of all those who may need to read it. Translations can be provided, MP3 players can be made available. 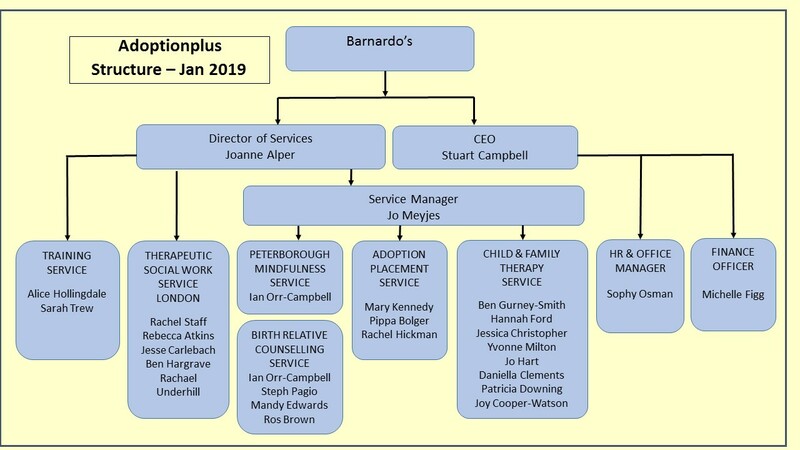 The Statement of Purpose has been approved by the Directors of Adoptionplus and is subject to review annually, or more frequently if required.